White Label Wednesday: Jane's Addiction, "Been Caught Stealing"
A la da dat dat dadat, dat dat dat, fuckers! It only took one listen of Ritual de lo Habitual (1990), the much-anticipated sophomore effort by Jane’s Addiction, to know what the second single was going to be. They came screaming out of the gate with the slammin’ “Stop!” – it physically hurt me to hear that song used in a trailer for “Herbie: Fully Loaded” – so the next release had to be the one with the dogs. Talk about a song that literally elicits a Pavlovian response; I hear those two chords, and I start barking. 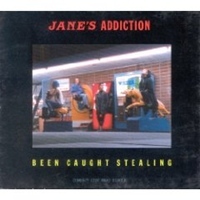 What has been lost in the nearly two decades since the song’s debut, however, is the fact that a large percentage of the Jane’s fanbase actually hated “Been Caught Stealing” upon first listen. Compared to the more experimental, drawn-out songs like “Three Days” and “Then She Did…”, “Stealing” looked like a sellout move, back in the day when it was still verboten to sell out. Today, of course, it’s the band’s most enduring song. Go figure. Now imagine the uproar when the band announced that it was commissioning a remix of the song for the clubs. By late 1990, DOR – Dance Oriented Rock, for you young ‘uns – was dead, and house music was in full swing, so the idea of a house mix of “Been Caught Stealing” was, rightfully, terrifying. Ah, but we should have known that the band would never let that happen. Singer Perry Farrell mixed the track himself, with the help of engineer Ron Champagne, and the end result is one of the last great rock remixes. It opens with some percussion – I’m not sure if it’s in the original track, but if it is, it is very well hidden – and some acoustic guitar (again, well hidden), a snippet of Farrell scatting, and then the two chords. Cue dogs. Typical ’80s-style build-up, but when Eric Avery’s bass drops, you finally understand why the band did the remix: the album version, to be frank, is a cluttered mess. The bass in the remix is more prominent but doesn’t overwhelm the other instruments – it all just sounds cleaner. They also, wisely, raised the pitch a half-step, giving the song an extra dose of energy. Listen to the two back-to-back sometime. The original version sounds like it’s sleepwalking. The only mistake Farrell makes is in inserting the scatting line into the music before the first verse. It’s completely out of key (not to mention a little bit behind the beat), and you can actually hear the ambiance noise drop out at the end, giving it the effect of someone trying to drop it in live from a turntable. (I would know: most of my drop-ins when I DJ’d were out of tune and off the beat.) But that is my only complaint with this mix. Even the length is perfect, clocking in at less than four and a half minutes, just long enough to stretch the song out without overstaying its welcome. Bravo, Perry.